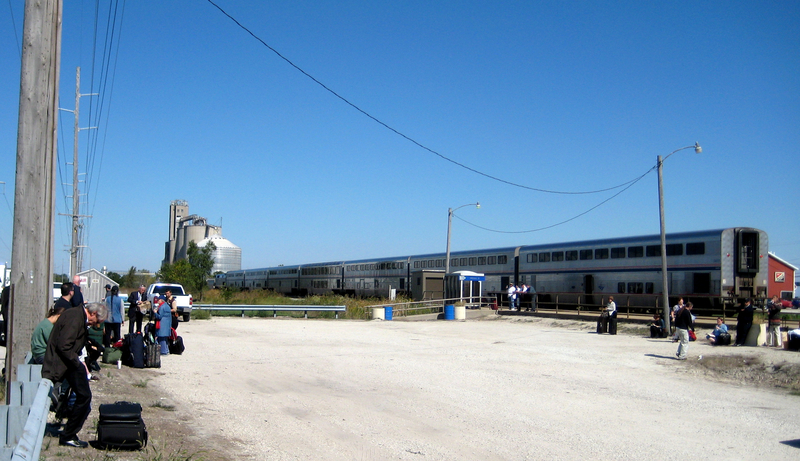 Jackie and I traveled by train to Chicago, going up Tuesday and returning Wednesday. I like traveling by rail. It’s is more comfortable and more convenient than traveling by either car or plane, especially if you’re going to want to be downtown (where the train station is) anyway. So, as I’ve written before on Wise Bread, I’m a big fan of Amtrak. On the trip up, though, we did have a problem. Apparently, a freight train had derailed somewhere north of Gilman, leaving the track blocked. The passengers who’d been faster getting off the train than us had already filled the first bus and departed, so here the rest of us are, waiting for the next bus. I’m not sure what train that is sitting there. 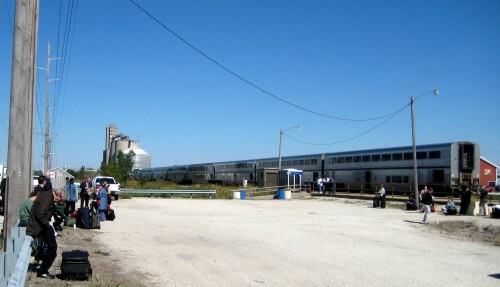 The train we’d been on (the Saluki) had already departed, heading on back south to be ready for the next day’s trip to Chicago, I suppose. The station itself is that bus shelter structure in the middle of the picture. Me: What do you suppose it is? Jackie: An amusement park ride? Me: Maybe. Maybe it’s a solar power station. Jackie: But it’s all shiny. That wouldn’t be very efficient. Me: I bet I know! I bet it’s designed so that one day a year, when the sun is at a particular point in the sky, all those surfaces work together to concentrate the entire reflected power of the sun on one single point, vaporizing whoever happens to be standing there. Jackie: That doesn’t make any sense. Think of the liability. Me: You’re right. I guess amusement park ride is a better guess. Today we took a bus down to Jackie’s old stomping ground in Hyde Park. We went to the Oriental Institute, the Seminary Co-Op bookstore, had lunch at Edwardo’s, and went to 57th Street Books, before heading back to Chicago and catching the Illini to come home. A good trip, despite the unplanned bus ride from Gilman. Cool! Did you see that giant bean in Millennium Park? Cloud Gate, I guess it’s called, but it sure does look like a big bean. 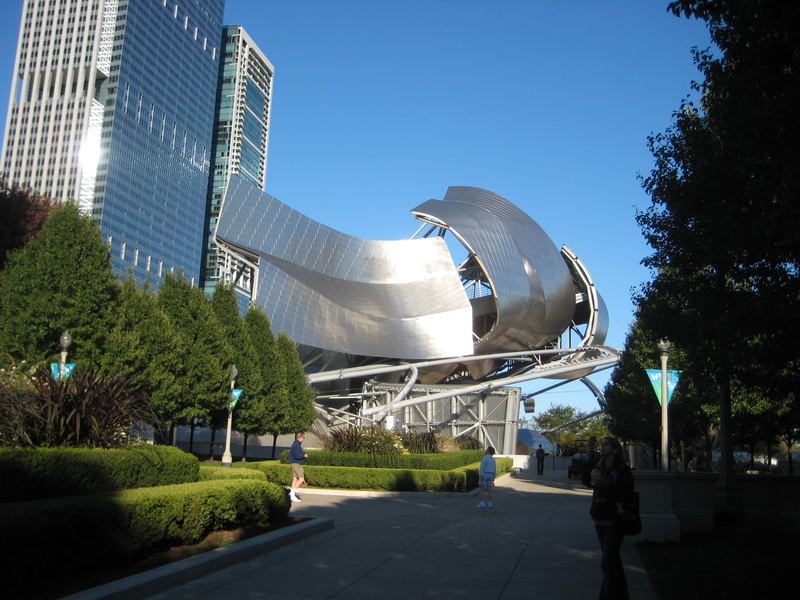 I saw it when I went to Chicago for my daughter’s first college graduation in 2008. She’s graduating again in May, so I’ll be going back again, I hope. We went everywhere in the city by bus and train. I can’t imagine trying to drive in that city. Oh, yes. We saw the Cloud Gate. I even got some pictures. But one picture of a big, shiny bean looks rather like any other picture of a big shiny bean. I’ve driven in Chicago, and it is, in fact, no fun.